You might not have realized that there is a whole world within our world – the world of the Amoeba, one-celled organisms that go to school, trade lunches and even read comic books during class. My students know all about Squish. In fact, this is one series that i s always mentioned when I ask them about their favorite graphic novels. Squish is just such an amoeba. He has friends, Pod and Peggy. Peggy is an extremely nice paramecium. She’s actually a little too nice sometimes. In fact, one day, after Squish and his friends sit in detention, Peggy chats away to the school’s bully, Lynwood. Lynwood is a “scary amoeba” that loves to eat paramecium. Squish sees Peggy talking to Lynwood and fears that Lynwood will actually eat Peggy right there in detention. Squish has a decision to make. Should he do the right thing and step in to save Peggy, just as his hero, Super Amoeba, would? Or, should he walk in the other direction. Find out what Squish decides to do and how a little slime mold can be a good thing to have around. My students absolutely love this series. The Squish series currently has 6 books, with book 7 due to be released on August 25, 2015. Jennifer Holm and Matthew Holm also write the Babymouse graphic novel series. This graphic novel might just rank with Amulet as my favorite in my library. 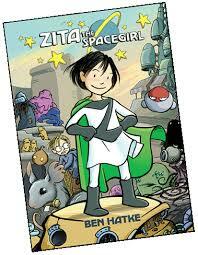 Zita the Spacegirl has characters you’ll love, evil villians, wonderful drawings and a plot full of suspense. It is a huge favorite with my students. Zita and her friend Joseph are surprised when a small meteor hits the earth where they are playing. Zita is adventurous. She goes into the small crater and finds an interesting object that looks like a button. As all adventurous girls are wont to do, Zita pushes the button. Off goes Joseph onto another planet. Zita quickly presses the button again and finds herself on the same strange planet, just in to see Joseph kidnapped. Zita meets new creatures that soon become friends, a large creature she names Strong Strong, another called Mouse and Piper. She learns that this new planet is just about to be destroyed by an enormous asteroid. Everyone is trying to get off the planet before the asteroid hits. Zita is determined to find her friend. She learns that he has been taken prisoner by the original creatures to inhabit the planet, Scriptorians. The Scriptorians think that sacrificing Joseph will stop the asteroid. Zita sets out with her new friends to find Joseph and save him. Will they be successful? Who will try to stop them? Will the planet survive? Read Zita and the Spacegirl to see how one strong, adventurous girl can team up with friends and make things happen. Don’t miss the next two books in this trilogy, Legends of Zita the Spacegirl and Return of Zita the Spacegirl. Look for Ben Hatke’s new book, Little Robot, to be released on September 1, 2015.